Summertime is tuna time. 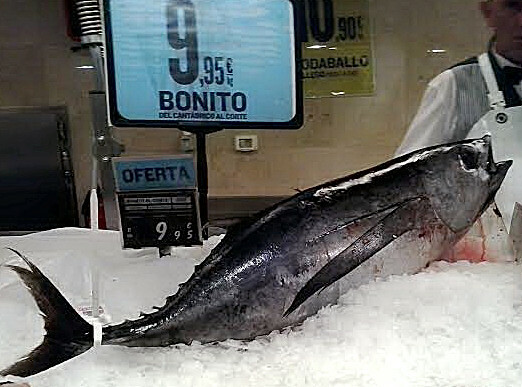 Both the Atlantic bluefin tuna, atún rojo, (Thunnus thynnus) and the albacore tuna, called in Spanish bonito del norte or atún blanco, (Thunnus alalunga) are fished off Spanish coasts. The bluefin are captured as they head for the Mediterranean (see more about the almadraba tuna fishing here ) while the albacore are caught on the northern Cantabrian coast and Bay of Biscay. 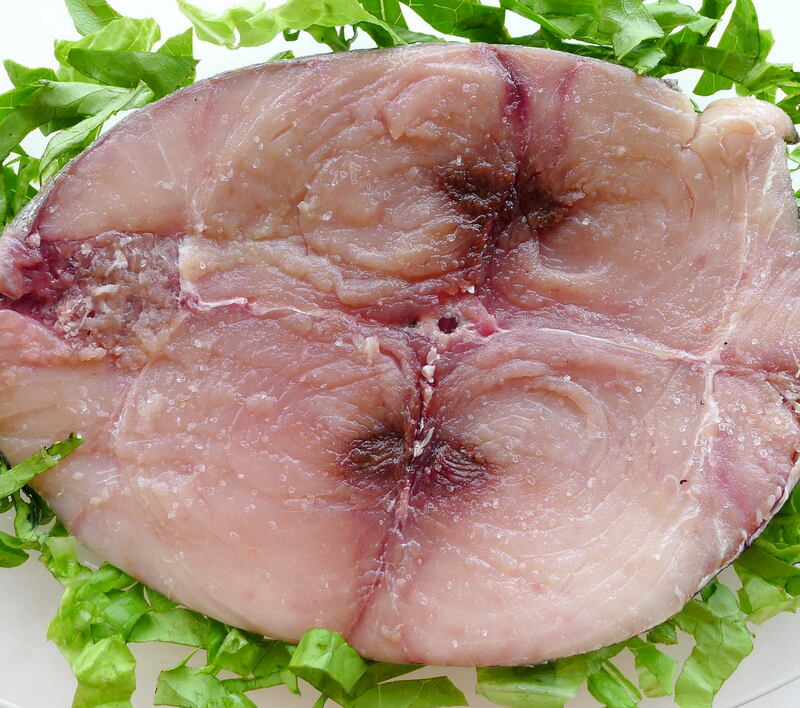 A great price for bonito del norte--albacore tuna. 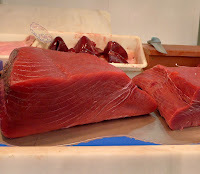 It was albacore, or bonito del norte, that I found at a local market at a really good price for either the whole fish (big, but not as big as bluefin) or a thick steak. I’ve been buying canned bonito del norte instead of tuna for a long time, as the albacore, with catch quotas in place, is less threatened than the bluefin. But I had never cooked it fresh before. 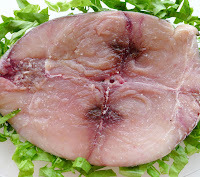 Albacore, which can legally be called “white tuna,” really is much lighter-fleshed than the deep red tuna. Less fatty, it can be dry if overcooked. 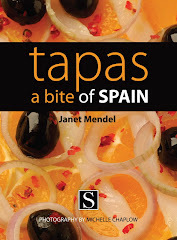 I tried it two ways—quickly grilled on a plancha and cooked in a traditional Basque stew. 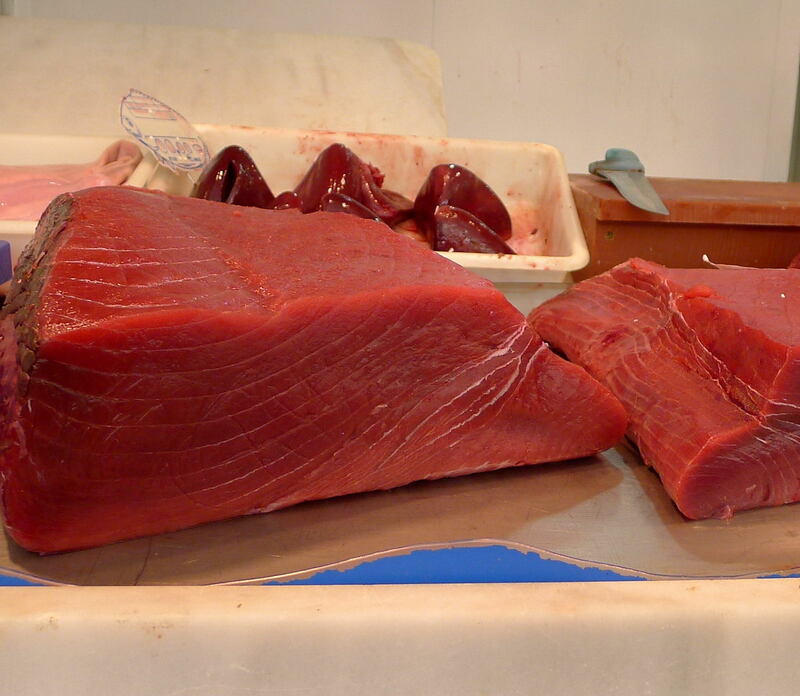 Bluefin tuna has red flesh. 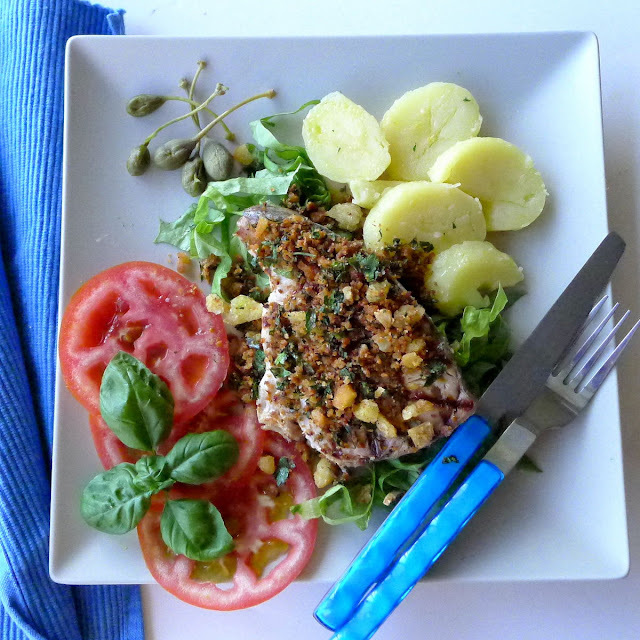 Grilled tuna has a crispy topping of garlicky breadcrumbs. 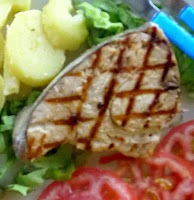 The bonito steaks can be grilled on a plancha, over coals (a la parilla) or baked in the oven. If baking the fish, mix the crumb topping ingredients and spread them on top of the fish without first sautéing them. Sprinkle the fish steaks with salt and pepper and allow to stand at room temperature for 30 minutes. Brush them with 1 tablespoon of the olive oil. Heat 3 tablespoons oil in a small skillet. Add the garlic, thyme and chile. Sauté until the garlic begins to turn golden. Add the lemon zest and bread crumbs. Toss the crumbs in the oil until they are golden and crisped. Remove from heat and stir in the parsley. Ridged grill pan marks the steaks. Heat a ridged grill pan on high heat. Brush the grill with remaining oil and sprinkle it with coarse salt. Place the bonito steaks on the grill. Cook 2 minutes and turn the steaks a quarter turn (in order to get cross-hatch grill marks). Grill 2 minutes longer. Flip the steaks and cook the reverse side in the same manner. Remove to a platter and spread the garlic-crumbs on top of the steaks. 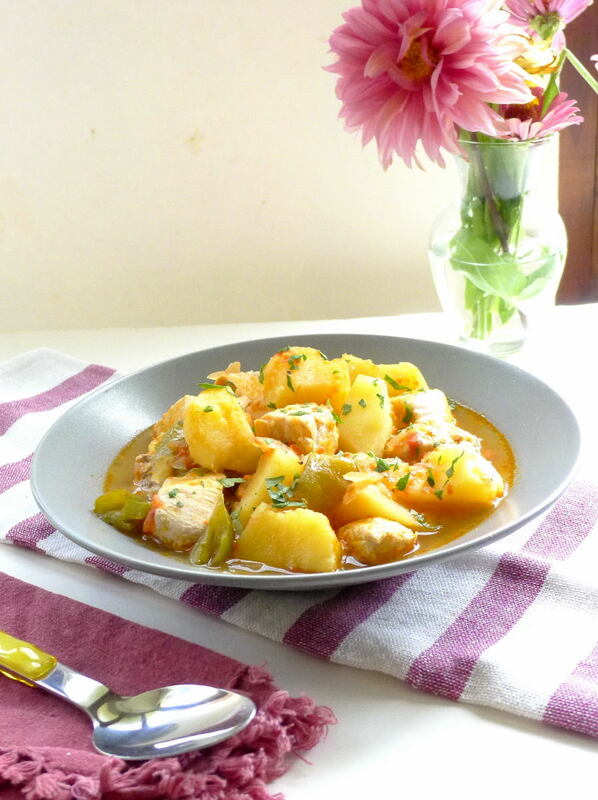 Chunks of white tuna simmer in a flavorful sauce with potatoes. 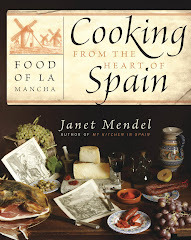 Marmitako—from the word marmite, a cooking pot—was traditionally made aboard Basque fishing trawlers. 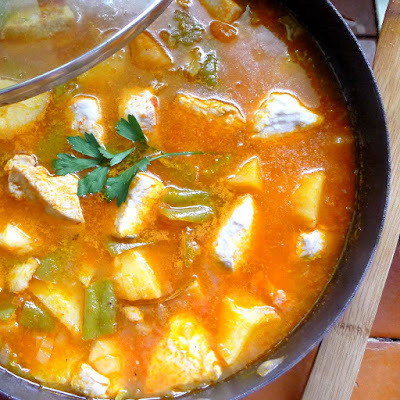 Originally, it was a stew of bonito boiled with bread and a chunk of salt pork. 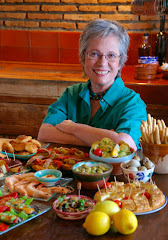 Once it became part of home cooking, potatoes, peppers and olive oil became standard ingredients. 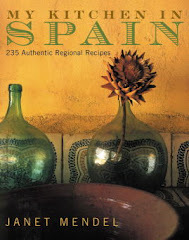 This recipe is based on one in Cocina Vasca en Bizkaia, by Jesús Llona Larrauri, Garbiñe Badiola and the Escuela Superior Hostelería Artxanda. It substitutes roasted red bell pepper for the usual pimiento choricero, a dry red pepper that has to be soaked and scraped. Typically, the potatoes are not cut with a knife, but broken into uneven pieces. Insert knife tip into the potato, twist it to break off a chunk. The broken surfaces release starch that helps to thicken the stew. 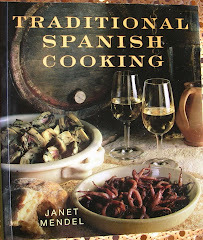 A frugal home cook would use the bones and trimmings of the bonito to make a simple fish stock. (Cook the trimmings in 4 cups of water with salt and a slice of onion.) Use any fish stock or, simply, water. 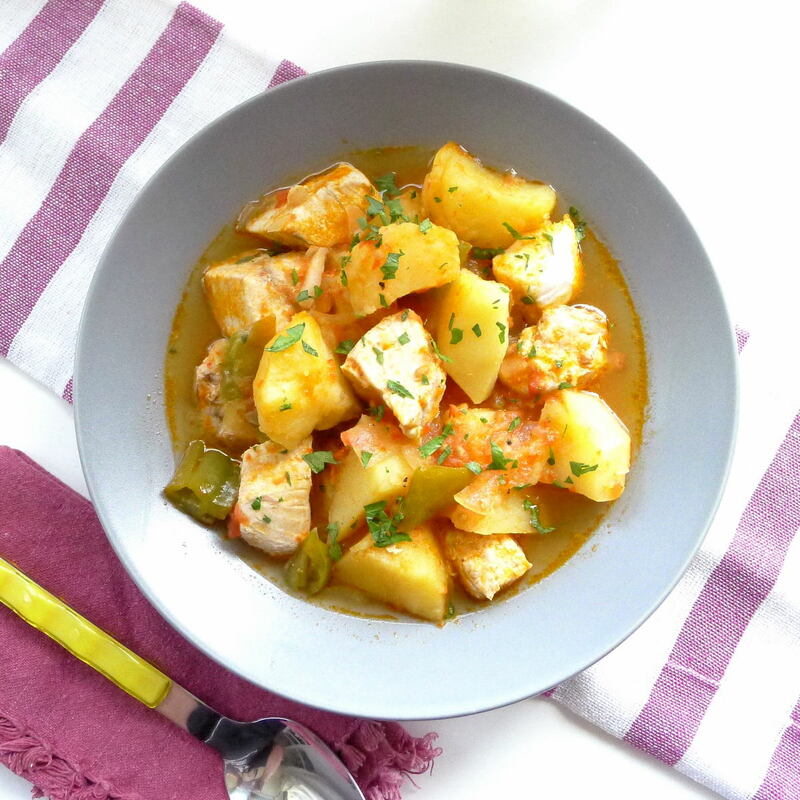 Marmitako--a Basque dish of white tuna, potatoes and peppers. Remove all skin and bones from the bonito. Cut the fish into 1 ½-inch chunks. Sprinkle them with salt and pepper and set aside, refrigerated. 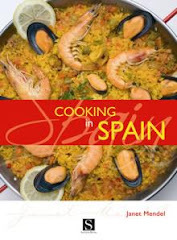 Heat the oil in a lidded cazuela or skillet with the bacon, if using. Add the green pepper, onion and garlic and sauté gently 5 minutes. Turn up the heat and add the tomatoes. Fry them until they begin to thicken and stick on the pan bottom. Add the wine and let it cook off. Add the potatoes, 1 teaspoon salt and the bay leaf. Put the pepper pulp and hot pimentón, if using, on top of the potatoes and pour over enough stock or water to nearly cover the potatoes. Bring to a boil, cover and turn down the heat so the liquid just simmers. Cook until potatoes are tender, about 30 minutes. Add the chunks of bonito. Cook until fish is just cooked, about 5 minutes. Remove from heat and allow the stew to set for 10 minutes. Serve sprinkled with chopped parsley. THE LAST GRILL OF SUMMER?